Nothing is truly free, there is always a cost to someone, even if it is just time. If you are providing a service, and you give something away, not only is there a cost associated with your time, but there is also an opportunity cost where you could have charged for that service. 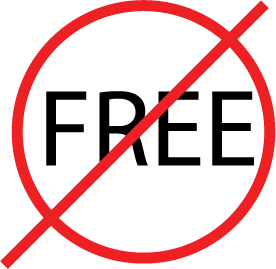 Offering something FREE has the same effect as saying something is “nice” or “cheap” the word tells you exactly how much effort someone will put into reading it, digesting it and acting on it. FREE is the McDonalds of words. Available on every street corner and at the same price. When people are charged for a service, they know what they are in for. They become committed to the act. They become invested. “Free” has no emotional involvement. It is something you get in a christmas cracker.If you are writing anything that has to sell a product, you can choose words that take action, or ones that leave an empty feeling. If you are giving something away, or you are offering something with no cost involved, then make the customer work for it. Place value on it. Say “Take our survey to receive your personalised report worth $500.” Don’t let the customer think they are getting the left overs from people who do pay you. Make your customer believe they are getting something that actually has some value attached to it.